This calculator will tell you how much it costs to do various tasks with electricity depending on where you live. It will tell you in your own local currency, no matter where you live on the planet. All you have to do is select your location (or a location with similar power costs to where you live) and select the activity. This information will help you figure out where you can most easily save money and save the planet in the bargain. PowCost has an internal list of locations and the cost per Kwh. After you select a location and an activity, it multiplies together the cost of electricity per Kwh at that location, the time in hours of the activity and an adjustment based on today currency exchange rates to convert into your local currency. The raw information comes from many sources all over the Internet. If you have better costs, please send them to me, any currency is ok, cost per Kwh. Please feel free costs any locations I have not mentioned, or to make requests for still more activities. If you have not already done so, switch from a CRT (Cathode Ray Tube) monitor to an LCD (Liquid Crystal Display). Use you laptop, tablet or cell-phone in preference to your desktop computer. Use headphones instead of loudspeakers. If you fill your kettle with twice as much water as you plan to use, you will use twice as much electricity to boil it. You should turn off lights when you leave the room, even fluorescents. When you first start a fluorescent you use about one minute’s worth of power, not an entire night’s worth as urban legend would have you believe. Though the use of electricity does not generate any greenhouse gases, the process of generating it does, especially burning natural gas, oil or worst of all, coal. Different countries make their power in a different mix of ways. As you can see, the electric car takes 25 times as much energy as an electric kettle. If the electric car were to replace the gasoline car, the electric grid could not sustain the immense extra load to recharge them. A much bigger change is required, namely using much smaller, lighter vehicles, perhaps more along the lines of the Segway, the electric bicycle or a small single-passenger pod, computer-driven at densities impossible for human drivers. For this Applet hybrid to work, you must click grant/accept/always run on this site/I accept the risk to give it permission to allow you to configure the look & feel. If you refuse to grant permission, the program may crash with an inscrutable stack dump on the console complaining about AccessController.checkPermission. for the current version of PowCost. Calculates how much electricity costs depending on where you are and what you do to consume it. 3.6MB zip for PowCost Java source, compiled class files, jar and documentation to run on your own machine either as an application or an Applet. access powcost source in repository with [Tortoise] Subversion client on wush.net/svn/mindprod/com/mindprod/powcost/. download ASP PAD XML program description for the current version of PowCost. PowCost is free. Full source included. You may even include the source code, modified or unmodified in free/commercial open source/proprietary programs that you write and distribute. Non-military use only. 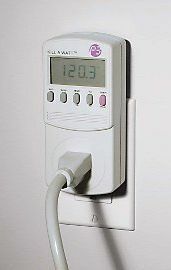 Measure power usage in watts of an appliance up to 1800 watts. Plug it into an outlet and plug your appliance into the unit. Comes with an LCD screen. There are three fancier models the P4600, P4480 and P4330. manual.